Slice the barramundi about 2-3 cm thick and marinate with 2 slices of ginger, a pinch of salt and a tsp of vegetable oil. 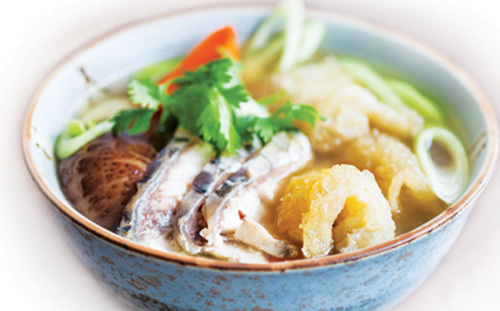 Roast the dried fish maw for 10 mins at 180ºC, followed by soaking 1/2hour before use. Bring the homemade chicken stock to a boil. 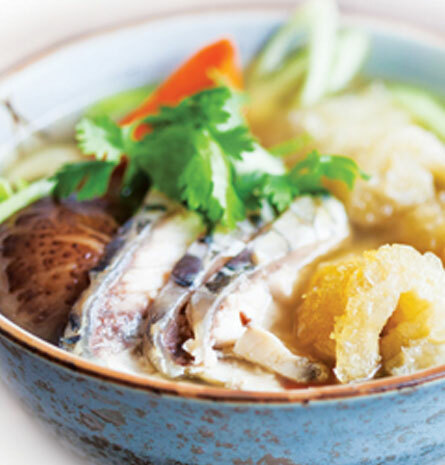 The barramundi fillet slices can be cooked separately in chicken stock and added to the rest of the soup to prevent overcooking of the tender flesh of the barramundi. The stock used for blanching the fillets can be added back to the soup.